Grade 5 titanium and stainless steel with detailing in black, green, blue or red. Dimensions: 46.8 x 44.3 x 20.7 mm. Rotating discs on top of the movement are reflected vertically and magnified by two sapphire crystal optical-grade prisms; a unique combination of mechanical and optical engineering. The HMX automatic movement displays bi-directional jumping hours and trailing minutes, powered by a 22k gold winding rotor. These oil caps are not just pretty design elements, but are fully functional oil caps that the watchmaker unscrews to oil the jewelled bearings of the indication discs. As a child, Maximilian Büsser dreamt of becoming a car designer and his sketchbooks were full of drawings of the supercars of his imagination. The automobile-inspired HMX is proof positive that the child in Max survived. Design influences like the distinctive ‘Superleggera’ style of renowned Italian coachbuilder Carrozzeria Touring resonate throughout the “coachwork” of the Machine. Visible through the sapphire crystal engine cover are supercar-inspired dual "rocker covers" on top of the movement, each featuring shiny chrome oil filler caps. The four colours of HMX are all carefully selected motor racing colours: black, green, red and blue. 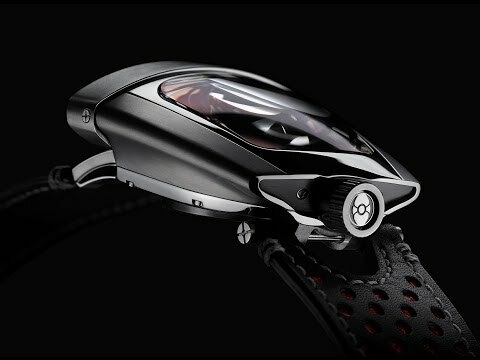 MB&F’s 10th Anniversary HMX is a limited edition of 4 x 20 pieces in grade 5 titanium and stainless steel, available in black, green, red or blue.